Charles F. “Chuck” Feeney, the international business leader and philanthropist who made a fortune worth billions and quietly gave it all away, is the inaugural recipient of a prestigious new award recognizing global generosity. 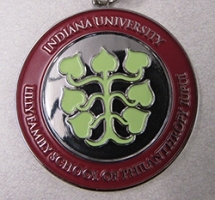 Feeney is the first person to receive the Stead Medal in International Philanthropy awarded by the Indiana University Lilly Family School of Philanthropy. The medal will be awarded to people who have demonstrated outstanding commitment and leadership in all aspects of international philanthropy and who have worked to sustain philanthropy as a globally significant force for improving communities, institutions and people. The co-founder of Duty Free Shoppers who for years gave anonymously through his foundation, The Atlantic Philanthropies, has made transformational grants totaling more than $7 billion to bring about lasting change in the lives of disadvantaged and vulnerable people around the world. Established as a limited-life foundation, Atlantic will complete its grant making in 2016. Millions of people around the world have benefitted from programs that Atlantic and Feeney have supported in aging, children and youth services, health and reconciliation and human rights. Many of these efforts are focused in Australia, Bermuda, Northern Ireland, the Republic of Ireland, South Africa, the United States and Vietnam. Atlantic’s support has promoted reconciliation and peace in Northern Ireland and South Africa, transformed the design and delivery of services for children, older adults and people with disabilities in both the Republic of Ireland and Northern Ireland, and strengthened and expanded higher education, university infrastructure and research in both regions. The foundation’s funding in Vietnam has revamped and revitalized health care facilities and practices, as well as bringing a world-class professional education to higher education students. In Australia, Atlantic has played a significant role in advancing research and development in information technology and biotechnology, higher education and cancer research. The Stead Medal in International Philanthropy was created in honor of international corporate turnaround expert Jerre Stead’s outstanding career as a philanthropist and his pursuit of developing the next generation of philanthropic leaders. Stead is chairman and CEO of IHS, Inc. a global information and insight services company that employs more than 8,800 people in 32 countries. He has served as chairman and/or CEO of seven major national and international corporations; in addition to IHS they include AT&T Global Business Communications Systems, AT&T Global Information Solutions, NCR Japan, Square D Corporation, Ingram Micro and Legent Corporation. Committed to sharing his time and talent with others, Stead has served on scores of corporate and nonprofit boards, including the Banner Alzheimer's Institute, the Garrett Evangelical Seminary and the Salk Institute, as well as the Lilly Family School of Philanthropy’s board of visitors.